Product prices and availability are accurate as of 2019-04-19 14:00:48 UTC and are subject to change. Any price and availability information displayed on http://www.amazon.com/ at the time of purchase will apply to the purchase of this product. Competitive Edge Products is pleased to present the brilliant Travelchair Slacker Chair. Chair has an integrated velcro strap and drawn aluminum tubing. Product folds down to compact size and includes a carrying storage bag. Colors offered include: green, red, black, and a blue and has a weight capacity of 275 lbs. The Slacker tripod stool is a lightweight camp chair that folds down small, it is easy to set up and is the perfect blend between comfort, portable and durability. At less than 2 lbs. you can bring along this three legged stool on your hike or simply leave it in your trunk until it is needed for the next game. Folds Down To Compact Size. Available in the following colors: green, red, black, and a blue. Shipping is fast and free on this 12-Pack of Slacker 1389 V TravelChairs. Orders for this TravelChair generally leave the warehouse within 1 business day. Please keep in mind that these twelve chairs ship in one carton via FedEx or UPS. They do not call to schedule a delivery. However, we do email you the tracking information as soon as it ships out. That way you can know what day to expect delivery. 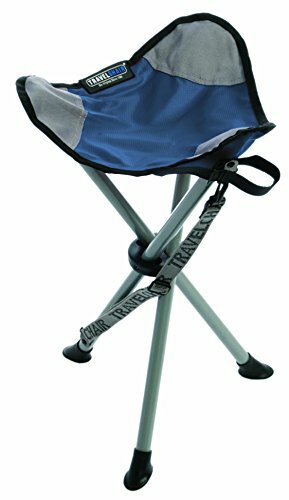 What is the weight capacity for the small slacker 1389 Collapsible Camping Chair? The official weight capacity is a robust 275 pounds. How many are in a 12-pack? Believe it or not this is a common question, but twelve come in a 12-pack. What if something is damaged in shipping ? No worries. Just give us a call and we will get it taken care of. Items that are damaged in shipping is quite rare as these are packaged to take a beating. TravelBench TBLG5: This bench is perfect for team sports, camping, and concerts. Canyon Portable Camp Table: This roll up table 2089SM is great as it takes up little space and can fit in the trunk of a car easily. View YouTube Video "TravelChair line demo - Stools"